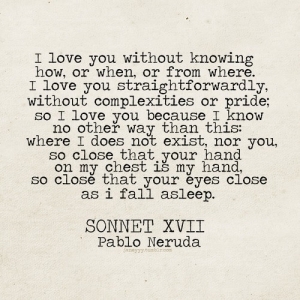 For today's Tuesday's Thoughts, I wanted to share an excerpt from Sonnet 17 by Chilean poet, Pablo Neruda, one that we chose to have read at our wedding. Incredibly tender and romantic, it is one we both treasure. The full text of the poem can be found here. And if you can read and understand Spanish, all the better.